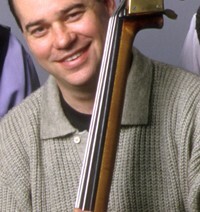 Bassist Tim Ferguson has been a highly regarded fixture on the New York scene for the last 20 years, playing and touring with his own projects and as a side-man with a variety of acclaimed jazz artists, including Don Friedman, Cecil Bridgewater, Mel Lewis, Eddie Harris, Tony Scott, George Cables, Stefon Harris, Vanessa Rubin and the world famous Vanguard Jazz Orchestra. Also a prolific composer, his works have been performed in concert by a variety of ensembles throughout the U.S. and Europe. An active educator, Ferguson teaches privately as well as having taught for a number of New York area schools and institutions, and has performed clinics throughout the US and Europe. He is co-author of “The Total Jazz Bassist” and “The Bass Line Encyclopedia,” both published by Alfred. He is a 1977 graduate of the Interlochen Arts academy, has studied with John Schaeffer, member emeritus of the New York Phiharmonic and has a Bachelor of Music in Jazz Studies from William Paterson College in New Jersey, where he studied with world renowned bassist and educator Rufus Reid.